Two Union Veteran Medals in case. 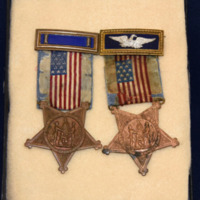 These star-shaped medals are inscribed with "Grand Army of the Republic, 1861-Veteran-1866". The medal hangs from a ribbon showing the Union flag and a blue bar, one of which features an eagle. 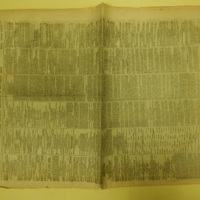 A copy of the New York Herald Newspaper from 1863. 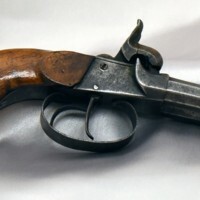 1860s-era Double Barrel Percussion Pistol. 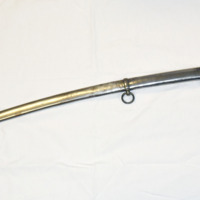 This pistol is metal with a wooden handle and does not feature a brand name. It has 3 inch barrels. 1860s-era folding cup with cardboard case. This sturdy cardboard case has a faux-leather exterior for decoration. The collapsible cup consists of five interlocking rings. 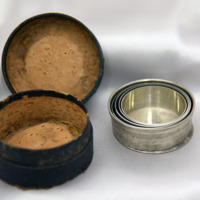 Such easily-stored cups were popular and useful personal items for soldiers. 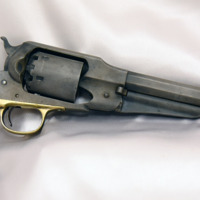 This .44 caliber New Model Remington Army Pistol was manufactured by Eliphalet Remington & Sons around 1863. 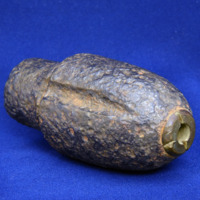 This 3 inch Hotchkiss Artillery Shell was a very common shell type manufactured in the Civil War. 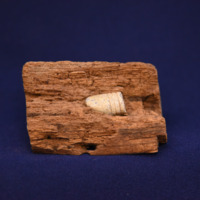 The shell itself has a diameter just under 3 inches (2.97 inches) and is 5.5 inches long. It would have been shot from a 3 inch wrought iron rifle. Southern Cross of Honor Medal. 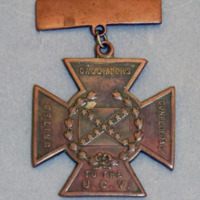 This medal was created by the United Daughters of the Confederacy to be given postwar to Confederate veterans who showed valor in battle. The medals were created in 1898 and distributed beginning in 1900. Amputation Saw. 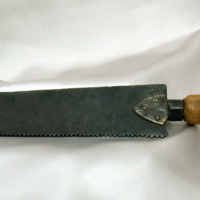 This serrated bone saw is approximately 16 inches long with a metal blade and wooden handle.